This is a beautiful binary clock kit by AppleMountain Electronic Kits and Curiosities, and you can Order one from here. 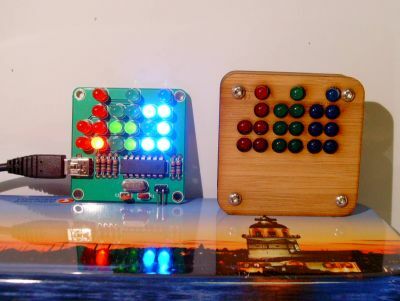 It's a USB powered (mini-USB connector) binary clock using an Atmel AVR ATtiny44 microcontroller. It is available with or without the bamboo case. I have two kits: one for the shack, one for the office, where I'm going to run a study of how many modern software engineers can actually read binary. Both clocks have the bamboo case but in the photo above, one is open so you can see the board. (Click for the larger photo version). Building the kit was nice and easy, completely trouble-free, and both kits worked first time. There's a paper with the kit, with building instructions and an explanation of how to read the clock. Building the first clock took me 24 minutes: 17 minutes to solder the board, 1 minute to try to remember (successfully) where I put that mini-USB cable, 3 minutes playing with and understanding how to set the time, and 3 minutes assembling the bamboo case. The second clock was a little faster to build. The little mini-USB connector needed a firm squeeze to get it to sit down in its holes properly. There are 7 of each colour of LED. This means I have one spare red one. It also means that you wouldn't have to follow the Red-Green-Blue (Hours-Minutes-Seconds) scheme if you wanted to order your colours differently. Personally I felt inexplicably compelled to maintain the natural order of nature with respect to the conventional RGB abbreviation. All in all, a nice kit, which will look great on my desk at work and here in the shack!